Styled to fit well and easy to wear, the Aspect Cool Dry Men’s promotional singlet is a great choice when looking for new uniforms for your sporting team or association. 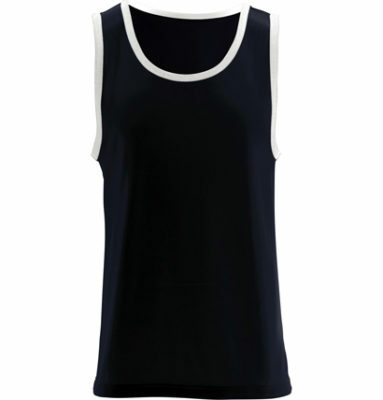 Featuring Cool Dry material with a flat hem and contrast stripes on the arm and neckline, this branded singlet is a great choice. Available in sizes from small to 3XL and in a variety of colour options, you’ll have plenty of choice when it comes to outfitting your team or supporters. These singlets are comfortable to wear, easy to wash and look great with a screen printed logo. The Aspect Cool Dry branded singlet is also available in a ladies version which means your full team or association can benefit from the same branding across all players and supporters. Get your team looking great in an Aspect Cool Dry Men’s promotional singlet. Made from 185g Cool Dry, the Cool Dry Singlet is styled to fit and easy to wear. It features a flat hem and contrast stripes on arms and neckline.